This is one of the brothers, the NPC that players click on to enter most GM events. Occasionally, but particularly around each version's Anniversary event, Game Masters (GMs) will host special GM events. These events are typically announced by the GM that is hosting the event about 10 to 15 minutes in advance. These events take place in Lith Harbor, Orbis, Ludibrium, or, very rarely, Southperry of Maple Island. These events only occur on one channel at a time, and can only be participated in once every 24 hours. There are numerous different types of events, both in teams or direct Player Versus Player competitions. The GM stands next to a special Event NPC which, when the event starts, players must click on to get in. A limited number of players can get in at one time. The GM will then enter the event map and start the contest. Once the contest starts, every player present receives an Event Trophy, a rare item only obtainable via GM events. When GM events are completed, each player who successfully finishes will receive a Scroll Of Secrets which, after a drawn-out quest, will result in a random prize. Coconut Harvest's Starting point. Note the point counters. 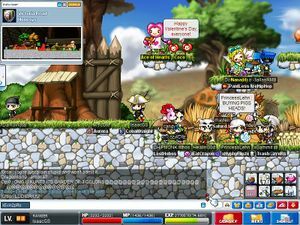 In this event, players are split into teams as they enter the map; team Maple and team Story. Teams are distinguished by red and blue swimming trunks/bathing suits that are automatically equipped upon entering the event. The object of this event is to knock down the coconuts from trees in the map as fast as possible in the allotted time. The game keeps track of the number of coconuts knocked down in a counter at the upper right hand corner. When the time runs out, the team with the most coconuts is the winner, and every member of the victorious team receives a Scroll Of Secrets. This event can be difficult because, unlike regular coconuts in Florina Beach, the amount of hits necessary to knock it down varies, and some coconuts, while they can be hit, will never fall, which can trick players into wasting time trying to knock them down. 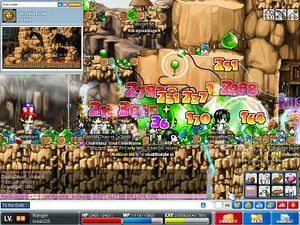 In this event, players are transported to a map resembling the outskirts of Ellinia. Players are required to navigate a maze of ladders and ropes to reach the proper teleport to the next map. Skills that increase movement speed are disabled here, as well as passive speed/jump additions. You may also not jump in this event. The object is to find the path to the correct teleport to reach the next map. Wrong teleports either warp you to the beginning of the level or do not activate at all. There are three levels in this event. In this event, several players are asked quiz show style questions by the GM. The map derives its name from the shapes formed by platforms located there. Players may be one on one or in teams at the GM's discretion. The winners of the event proceed through a portal and receive their prizes. 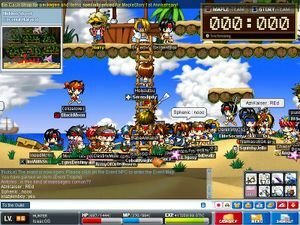 In this event, players are split into team Maple and team Story. The object is to roll a giant snowball as far as possible along the map, farther than the opposing team. The map is quite simply laid out; the map is split horizontally by one long platform, and there are markers along the path to indicate how far the snowball has gone. Players roll the snowball by whacking it with a weapon. Both sides of the map are the same, and you can see how far the other team has gone just by looking at their side of the map. In addition, there are snowmen located at the starting points of both teams to slow down or stop the other team from rolling their snowball. Snowmen can be used when you hit them. The team that has rolled their snowball the farthest is the winner. This NPC, Vikone, is involved in the event. This event is particularly special. It features the Viking NPCs from Lith Harbor. Players search a number of maps for a jewel which, when found, must be returned to the GM in exchange for the prize. There are a number of hidden maps off the main search area. It is divided into a central map, called (simply) Find the Jewel, an Eastern Field, and a Southern Field. Super Jr. Neckis, invincible Jump Quest style monsters roam the grounds and can be quite an annoyance. This event is by far the most difficult, encompassing parts of all other events. Players must overcome a Jump Quest populated by Super Jr. Neckis. The next map has no Necki but is also a jump quest styled area. The third area, also monster free, is increasingly difficult. Lag generated by the other event participants can hamper progress significantly. Finally, the Super Necki return on the last map, wreaking havoc on tiny platforms. By proceeding through the portal the player receives their prize. If they do not finish in the allotted time, the players are merely returned to where they were. These events are usually unofficially held by GMs at any time and place, and involve either playing Omok or Match Cards with a GM, and with rewards of either special GM buffs or other prizes. After successfully completing one of the above GM events, a player is awarded a Scroll of secrets, a dark item which will collapse after a certain date. To get their prize, a player must talk to Geanie of Ludibrium or Chun Ji in Kerning City. They will tell the story of the powerful item, and ask for certain items to aid them in containing the dark power. In Kerning, the player must collect 50 charms of the undead from Zombie mushrooms in Sleepywood's ant tunnel. In Ludibrium, special keys must be collected from Trixter, spider monsters found in Eos Tower. After doing this, the player will receive a magic box from the NPC, and is told to take it to Mr. Pickall, a master locksmith in Kerning City. He will request that the player bring him either 1 Sapphire and 5 slime bubbles, or 10,000 mesos. After this is accomplished, the player will finally receive their reward. The GlobalMS Invasion warning from the Official site. Perion being attacked by King slimes and hordes of smaller slime monsters. Unlike other events, this occurs in towns. GMs will summon hordes of powerful monster right in town, causing lots of death and destruction. These don't drop special event items or rewards, but still drop the ordinary items they would in the wild. The event ends when every monster is killed. Typically these are powerful bosses, like the Jr. Balrog, King Slime, Zombie/Orange Mushmom, Crimson Balrogs, and the like. Sometimes, the top bosses, like Horntail, Zakum, and Grandpa Gunboss are summoned in towns or free markets, requiring all of the high levels in the world to work together and take them out. Occasionally, the players get overpowered and the GMs must step in to aid them. These are the rarest and most sought-after of all events. 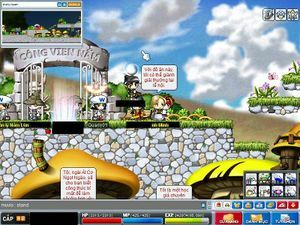 In the months of June and July 2007, GlobalMS had weekly summonings on Fridays, with a regular pattern. Perion was invaded by King Slimes and smaller slimes, Henesys was invaded by Zombie Mushmoms and many smaller mushrooms, Ellinia by pigs and boars, Kerning City by all 4 species of evil eyes, Sleepywood by MT-09 and aliens of Omega Sector, and finally Rombots and Block golems in Amoria. Then, the event heads over to Ludibrium's Path of Time, where massive numbers of Crimson Balrogs were summoned. GM's would revive players so that they could continue fighting. However, these attacks sometimes can prove to be a more troublesome lag than bosses like Zakum, as the limit to the number of people in the map is unlimited, with a massive number of monsters and dead players. If you are planning on fighting in these invasions, you need to have a very good connection, or you may accidentally die due to the tendency of lag causing people to be unable to see their status bars clearly. A GM's hints indicate He/She is located in Ludibrium. A GM gives buffs to those who find him/her. 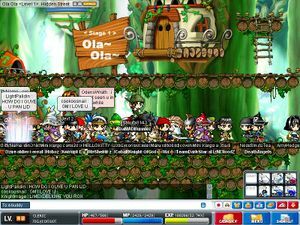 This event seems to be a favorite of the GlobalMS and MapleSEA GM's. Since GMs cannot be tracked using the /find function, GMs will hide in a map, give a hint as to their location through the Super Megaphone or the scrolling message at the top of the screen, and wait for someone to find them. The rewards for this event are usually super GM buffs, like solo Holy Symbol, Super Haste that lasts for 30 minutes, or other various skills. This page was last edited on 21 May 2011, at 06:23. This page has been accessed 84,379 times.